Chairman Mao envisioned a unified society in which ethnic, gender, and class inequalities were nonexistent. His ideal society was in direct opposition to the Western imperialism, specifically capitalism, that had inhibited the political and economic growth of China. 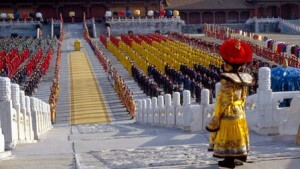 Removing these inequalities was part of his efforts to bolster national pride in China. Chairman Mao introduced the Mao Suit to China in the late 1950’s with the effect being to “‘Civilize the mind and make savage the body.’ This is an apt saying. In order to civilize the mind, one must first make savage the body. If the body is made savage, then the civilized mind will follow.” (Chen 361). 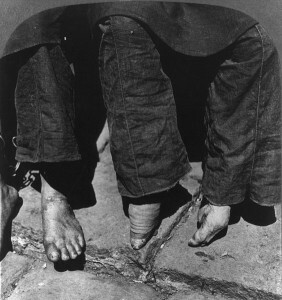 Chairman Mao took this to mean that the body is meant to be improved upon, to be strengthened. He wanted to uplift the proletariat class, who traditionally performed manual labor, and highlight their value to Chinese society. 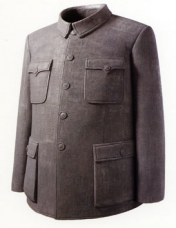 The Mao suit was a button-down shirt with either pants or trousers, denoting one’s occupation as a proletariat or farmer, respectively. The peasant workers wore trousers to show off their “well-formed calves” and rolled up their sleeves to show off their “powerful arms” (Chen 365). how about focus on the analysis of gender and mao suit? For Chinese women, the Mao suit created an opportunity to be equal with men. Each profession had a standard uniform that every worker was required to wear, and workers were evaluated on many tasks they completed during their shifts. Mao eliminated the benefits that beauty and propriety had initially given upper-class women. In addition, men and women worked alongside each other, and were encouraged in the same manner to strengthen their bodies and increase their productivity levels. Through the Mao suit and changing ideals of professionalism in the workplace, Chairman Mao achieved political, economic, and social uniformity among Chinese people, regardless of their ethnicity and other marginalized aspects of their identity. However, Mao’s cultural uniformity eliminated the concept of femininity altogether. 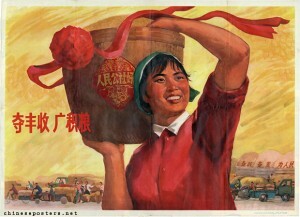 In advertisements and propaganda promoting the communist agenda, women were portrayed as hard-working individuals who were happy because they focused solely on their occupations. Women had short hair that was tucked under a hat or hair-wrap, and wore little to no makeup. 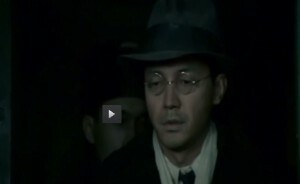 The uniforms were shapeless so as to direct attention to the parts of the body that were visible (i.e. arms and legs). By forcing women to build muscle and work harder in the fields or in the offices of proletarians, Chairman Mao sent the message that equality could only be established by having both men and women conform to the standards of appearance and productivity initially forced upon men. Women’s bodies were in flux when it came to changing professions. 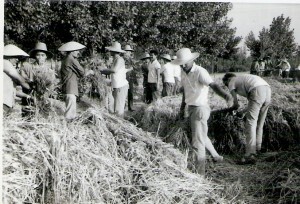 In the agricultural sector, every individual wore the same suit and completed the same tasks. In the proletariat/technocratic fields, such as the textile industry, women had to wear different clothes to both signify their upward mobility and cover different parts of their body. Men, on the other hand, continued to wear trousers and button-down shirts. They did not have to alter their clothing in order to conform to the rules of different workplaces. Overall, Mao did not achieve his quest for gender equality. Women could not engage in traditional beauty or fashion practices because they were required to focus on work and gaining strength. The shapeless Maosuit did not allow women to showcase their bodies. Women did not have uniform clothing, but were forced to change their garments when they changed professions. While unintentional, the gender inequality between men and women resulted because the standards for equality were not recreated to include the cultures and identities of women before the cultural revolution. Instead, women were forced to meet the societal standards placed upon men. could pursue a much more cohesive organization, if take the thematic issue of gender (in)equality in terms of Mao uniformity as the central focus, then explain in detail, how the visual denotations construct socialist female body. This entry was posted in Fashion and Gender in China, The Socialist - Mao suit on March 30, 2016 by abomboka. 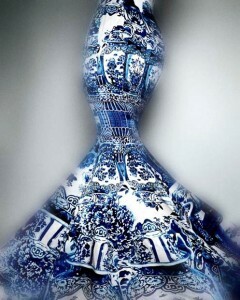 Liu Jianhua’s Game Series calls the authenticity of the qipao, and ultimately its cultural meaning, into question. 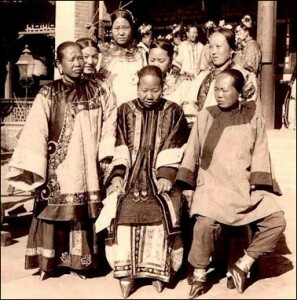 Initially, the qipao was sanctioned by the Chinese government in the early 1900’s as the official dress for women in China. The qipao upheld Chinese national pride by showcasing patterns and designs specific to the Chinese fashion industry while allowing women an increased range of motion. Chinese women were empowered by the qipao because they could choose the design and cut to show as much of their body as they were comfortable. 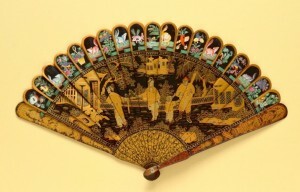 Affluent women were able to dabble in Western ideals of fashion (by experimenting with Western patterns and designs) without backlash from society because the shape and the cut of the qipao were distinctly Chinese; this distinction placed national identity above the individual appreciation for Western ideals. The qipao fell out of favor in the 1950’s-1960’s due to Cultural Revolution and the Socialist period that followed under Mao Zedong. The qipao had come to represent over-extravagance and wealth, which was frowned upon during the socialist era. In the 1990’s, however, the qipao underwent a cultural emergence due in part to China’s growing economy and political stability. What truly brought relevance to the qipao was the renewed cultural pride that began in the fashion industry and was consumed by the general public and the West. This is where Liu Jianhua’s Game Series becomes important in understanding the peculiar place of the qipao. Currently, the qipao is a cultural symbol but does not have national backing as it did from the 1920’s – 1950’s. As a result, the qipao has become less about empowering Chinese women and upholding national pride as much as it is about the qipao a commodity for mass consumption. While many fashion houses, Chinese and Western alike, are paying their respects to the traditional Chinese dress, they have left out the designs and cuts specific to Chinese culture. good point, are you going to support it? what does the photo of Katy Perry with Liu Jianhua’s work? I feel confused. LIu Jianhua purposefully chose to remove the heads of the women he sculpted to show the audience that when we consume the qipao, we are not focused on the people wearing the dress but on the dress itself and its ability to be modernized. He has the women positioned with their legs spread open to show the viewer that the qipao has become a object with which to objectify women. 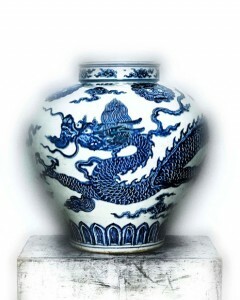 Qipaos now, such as the one worn by Katy Perry at the Grammy Awards, do not provide as much covering for women as they used to. is it better to focus on one image? In addition, Liu Jianhua purposefully sculpted the women’s bodies without arms to indicate that they are powerless to the men that objectify them, and furthermore that the qipao is powerless against those that interpret it out of the Chinese context. Liu Jianhua chose to put the women on porcelain plates as an “offering” to the viewer. These women, who are headless and powerless, are up for the taking in terms of the male gaze. Their bodies and the designs of the qipao are also available for the fashion industry, both Chinese and Western, to have as much or as little as they want. raised number of good points here which need careful and analytical explanation. While some might critique Liu Jianhua’s Games Series as extremist, I argue that he is providing a social commentary not only for men, but for Chinese and Western civilization. It is warning against the objectification of women’s bodies, and the dehumanization and dis-empowerment that results. It is a sign that the qipao is not authentically Chinese anymore; it has been interpreted through various lenses within the fashion industry and has lost its origin, at least, in eyes of the average western consumer. if this is the argument, then introduce it at the beginning. This entry was posted in Fashion and Gender in China on March 2, 2016 by abomboka.